AMMAN, Jordan, 26 August 2016 – Zade Dirani has played for Royalty and packed audiences in concert halls in America, Europe and the Middle East. But last week’s performance was truly unique. 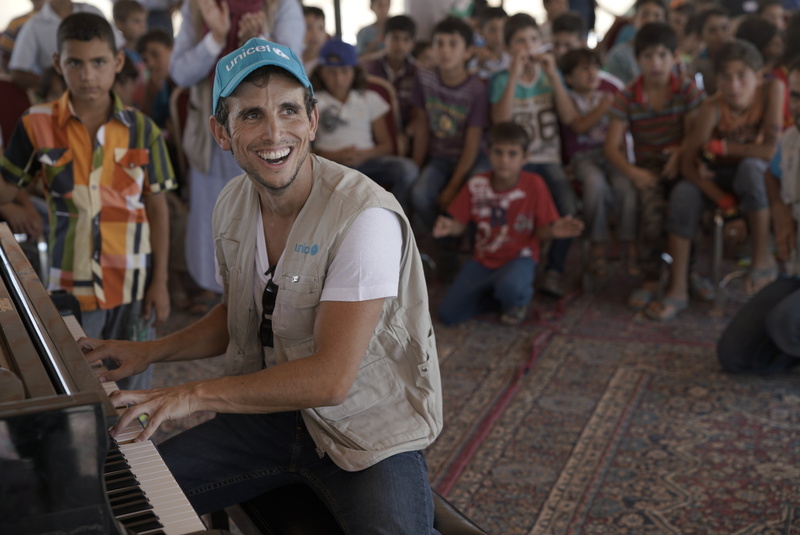 “I think this was one of the most powerful experiences I have had in all the years performing,” said Dirani, after taking a piano and aspirations for peace to Za’atari refugee camp and the nearby town of Mafraq. 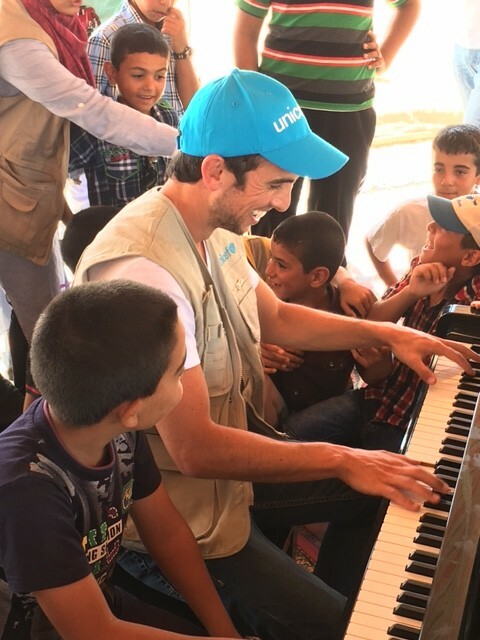 The Jordanian pianist and UNICEF Regional Ambassador for the Middle East and North Africa came to share his music and message with children and youth, many of whom have fled violence and war in Syria. Za’atari refugee camp, just a short drive from the Syrian border, has become home to some 79,000 Syrian refugees. Many fled their homes with little else than the clothes on their backs. Around 3,000 small shops offering items from mobile phones to sparkling dresses have popped up inside the camp as families do their best to carve out a small existence and supplement the vital support received from humanitarian workers, the Jordanian Government and the donor community. In a small caravan crammed with children and adults that make up three generations of one family, Dirani got a first-hand account of what life is like in Za’atari and the heartache that many families go through. This was Dirani’s first field visit since becoming a UNICEF Regional Ambassador earlier this month. Children flocked around him, taking turns to play alongside the famed pianist, and setting in with the sounds of drums and Arabic flare. In one classroom Dirani visited, fingers went flying into the air when students were asked what they wanted to become. ‘A doctor, mechanic, pilot, scientist, a teacher’ – the children shouted back. One boy said he wanted to be a pediatrician to help the children of Syria. Dirani visited a second Makani centre in Mafraq town where Syrian refugee children along with Iraqi, Jordanian and other vulnerable children from the host community can come to learn or get counselling. A vital part of the activities at the Makani centres is to develop respect and tolerance for others. It is exactly that message that Dirani has been promoting through his music and by establishing the “Zade Foundation for International Peace and Understanding,” which helps other musicians do the same.